In so many ways, the NBA Finals matchup between the likable Oklahoma City Thunder and what has become the unlikable Miami Heat will be hyped as a series that will be defined by the team's two superstars. The Thunder's Kevin Durant has developed into one of the game's best players who is well-liked. The Heat's LeBron James remains one of the NBA's top players who still is a polarizing figure cast as a villain since taking his talents to South Beach. The spotlight in this best-of-seven series that starts with Game 1 on Tuesday night in Oklahoma City at Chesapeake Energy Arena also will shine on the other stars. Both teams boast their Big Three — the Thunder has Durant, Russell Westbrook and James Harden and the Heat has James, Dwyane Wade and Chris Bosh. The Heat is in the Finals for the second straight year, having lost the NBA championship last year to the Dallas Mavericks. The Thunder is in the Finals for the first time since 1996, when the franchise was the Seattle SuperSonics. 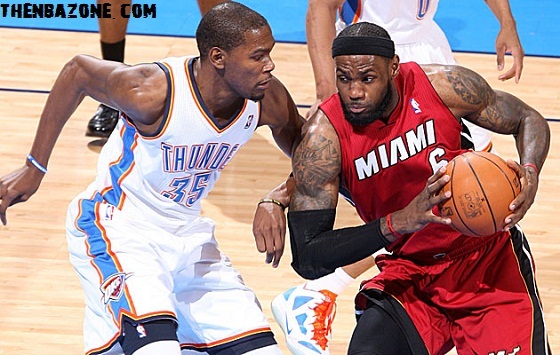 On so many levels, the matchup between the Heat and Thunder is intriguing. 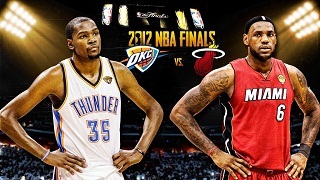 Miami's Wade and Mario Chalmers will face off against Oklahoma City's Westbrook and Thabo Sefolosha. Sefolosha, one of the NBA's better defenders, will have his hands full with Wade. Wade is at his best when he attacks the rim. Westbrook can be erratic, but when he's under control and looks to pass, he is very dangerous and explosive. EDGE: Heat, slightly. This probably will be the most fun matchup to watch. James and Durant, both small forwards, will go head to head frequently. James prefers to drive to the basket but has been knocking down his jumper lately. Durant is a smooth shooter with range who also gets to the hoop more. Then there are power forwards Bosh and the Thunder's Serge Ibaka. Bosh has a great mid-range game and Ibaka is a great shot-blocker who can make some mid-range shots. Don't forget, James was the league's MVP. EDGE: Heat, slightly; don't forget, James was the league's MVP. The Heat could start Udonis Haslem, Joel Anthony or Ronny Turiaf and that player will go up against Kendrick Perkins. EDGE: Even. Harden, who won the NBA's sixth man of the year award, is a force. Derek Fisher, the former Laker who has won five NBA championships, and center Nick Collison give Oklahoma City a strong bench. Shane Battier, who has been starting, Mike Miller and either Haslem or Anthony are solid reserves. EDGE: Thunder. Both teams rely on their top three players to provide the bulk of the offense. In the playoffs, the Thunder has been the top scoring team, averaging 102.3 points per game. The Heat has averaged 96 points per game in the playoffs, the fourth best. When the Thunder goes through Durant and Westbrook is under control, it runs a pretty smooth offense. The Heat runs a lot of isolation plays with James and Wade, and at times doesn't get enough ball and body movement because of that. EDGE: Thunder. Both teams like to play the passing lanes and both teams like to get out and run off turnovers. The Thunder has a shot-blocker in Ibaka, but Wade and James also protect the rim for the Heat. EDGE: Heat. Oklahoma's Scott Brooks and Miami's Erik Spoelstra are young coaches who work hard and have improved at their craft. EDGE: Even.